Just when Colbert Report fans thought it was going to be tough for Stephen to top the a cappella performance of "Lean on Me" with Michael Stipe (R.E.M. 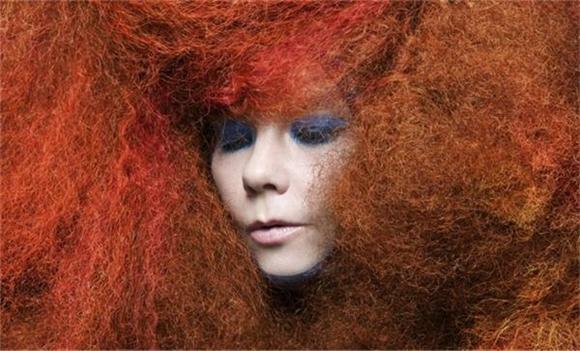 ), Brian Eno (Roxy Music), and Stephen Colbert himself, eccentric Icelander Bjork made an appearance on the show. Performing "Cosmogony" from her last album, Biophilia, Bjork still has that same ethereal and almost unworldly quality to her voice that has made her such an enigma for the last 15 years. We also got a simply hilarious interview where Stephen question Bjork about elves, licking her apps, and posing the "why art?" query. Bjork gets bonus points for wearing perhaps her most ridiculous outfit since the swan dress for the Oscars.